Midland Colleries, Marion 5760 Shovel. "This where the machine was at in assembly when my dad started. He was one of about 40 welders. They ran in three shifts, Dad was a second welder the whole time." The crawlers in place, waiting forthe first sections of the lower frame. "I'm sure it was hot welding inside." The lower frame is beginning to take shape, on top of the crawlers. Another view of the beginnings of the lower frame, This really shows the depth of these pieces. The holes in the frame are big enough to walk thru, allowing for easy access to all sections of the lower works. "Marion had one erector on days, and second. Did not have one on third." In this shot, we can see two of the steering cylinders lying between the crawlers. This view gives you a good idea of the size of the lower works. One of the crawler drives being hoisted. These were connected to each crawler with a drive shaft. Here we see the crawler drives setting next to the crawlers, waiting to be installed. Another view, but here we can also see one of the driveshafts lying next to a crawler. "After a few minutes of welding inside, the guys would be soaking wet." "All the metal was preheated, prior to welding." There's less height involved for lifting, and the machine is ready to crawl out and go to work when finished.. Here we can see the enclosed gear boxes on the crawlers. Early shovels were not driven directly by their propel motors, power came thru drive shafts from motors mounted above. Here again are the steering shafts, waiting to connect the crawler frames to the lower structure. The lower works are taking shape. Drive motors are installed, but as you can see.. the driveshafts are still not in place. On the rear of the foremost crawler, you can see the socket that the steering shaft will fit into. This show also gives you a good view of the cable reel and the swing rack. "Look on the left side at the end of the ramp, I believe that is the photgrapher. Look how brite, shiny and new everything looks, NO GREASE!! YET!!" Looks like most of the activity this day, was inside of the lower structure. There's a lot of steel sitting here, a solid foundation for a monster machine. A good overall view of the erection site. The swing rack is complete, here you can see the bolt together segments that make up the swing circle. Now the roller rail circle is in place, this is there the rollers will carry the weight of the revolving upper structure. None of these guys has an easy job, but the pride they take in their work shows in the finished machine. The upper rail of the swing circle is laying on the rollers. I guess it was assembled on them to ensure an exact fit. A Plumbers nightmare. Not sure if this for lubrication or hydraulic leveling, but there's a lot of piping involved. Electrical components of the propel system. This looks like an oil cooled transformer, but I may be wrong. "Thats my Dad with his back to us." The machinery deck is taking shape. All of the round holes at the rear of the machinery deck are ballast compartments. Before the machine is finished, railcars full of steel stampings will be brought in to fill these spaces. Large components of the machine arrive in gondola cars, it looks like pieces of the gantry have just arrived. note that the driveshafts are now connecting the gearboxes and the crawlers. At this point, the machinery deck has not been lowered onto the swing rollers yet. The entire upper structure is being supported by large hydraulic jacks. "One of the two welding is my Dad, overhead welding his favorite." In this shot, you can clearly see one of the hydraulic jacks supporting the machinery deck. "Hope those jacks hold, thats Dad on the bottom in the middle standing on the railing." however the large cylinder beside it is one of the leveling jacks for the machine. In the center of the swing rack is the king pin (center pin) of the machine. that turns a generator which produces the DC current for the machine. "Wouldn't ya just have loved to have been there?" Here we get a better view of the MG sets. The Machinery deck is filling up. Here we see an MG set in place, along with the hoist/crowd drums. The swing motors installed as well. Though shown in place in a previous picture, here we see the two stiff leg derricks hoisting an MG set into position. This is a great example of teamwork,. The 2 derrick operators must work together to carefully position the MG set. Another view of the MG sets being places, This one is framed by sections of the gantry setting beside the rail line..
Space on the machinery deck is limited, you can see that there's not much room for error when setting large pieces. Towards the front of the machine, you can see the four swing motors and gearboxes. Back legs of the gantry in place, waiting for the front half to be lifted by the derricks and pinned in place. Another view of the gantry before being lifted into position. I may be wrong on this, but it looks like the crowd drum isn't in place yet, but you can see the hoist drums waiting for cable. The columns standing on the deck are to support the overhead crane in the machinery house. All large shovels and draglines have overhead cranes for maintenance. Another view taken at roughly the same time. "154 steps on the boom." A bit farther along in the process, here the shovel is starting to take shape. The Boom is finished and pinned to the house. A lot of work has gone into getting the shovel to this point. This is when thing start coming together fast. In the foreground is the bucket, and to the right is the dipper handle. Cross bracing holds section of the bucket in place for welding. "Its starting to get exciting!" With the boom laying on the ground, the "grasshopper leg" is assembled. "These kinda pictures make the hair on the back of my neck stand up." The Crowd assembly (Grasshopper leg) provides the force to push the bucket into the bank. The U joint where the dipper attaches. This joint allows the dipper to travel front to rear while digging, as well as side to side while swinging. Great view looking up at the front of the machine. Hope that none of these guys are afraid of heights. "What a job! The guy on the left, Dean is a lifelong friend of Dads an operator, in 1982 they both went to Industry as operators." It takes some mammoth effort just to get the support cables into place. Rigging the pendant cables, which will eventually support the boom. Getting the cables rigged to raise the boom. Thing are nearly ready, and the boom will soon be raised.
" Raising the boom under its own power, hoist cables went around ganrty sheeves to boom point sheeves and deadended back at the gantry." "Would have been cool to be on the boom steps while it was going up." The boom is raised higher than normal, to allow slack in the pendant lines while they are pinned in place. The boom is shown here, being supported by the hoist cables. Looks like some painting has started, but the dipper is not in place yet. "Getting ready for a test drive. With the dipper in place and rigged, and the boom cables in place, the shovel looks ready to dig. "Instead of two running cabs, they chose to have one and then an automatic greasing system. Look at the onlookers in the dummy cab." "Thats Big Carl with the grease gun, Dad is standing next to him, with his Navy foul weather jacket. Dad said he could swing the dozer but not him. . The Business end of the machine. Another View of the massive bucket. The Bail handle and sheaves. A piece of history at the beginning of it's career. something we'll probably never see again. Last Look at the completed machine. My thanks to Joe Lang, Raymond Lang, Jim MacAfee and his Wife for sharing these pictures with us.. This Group of photos was sent to my by Joe Lang. 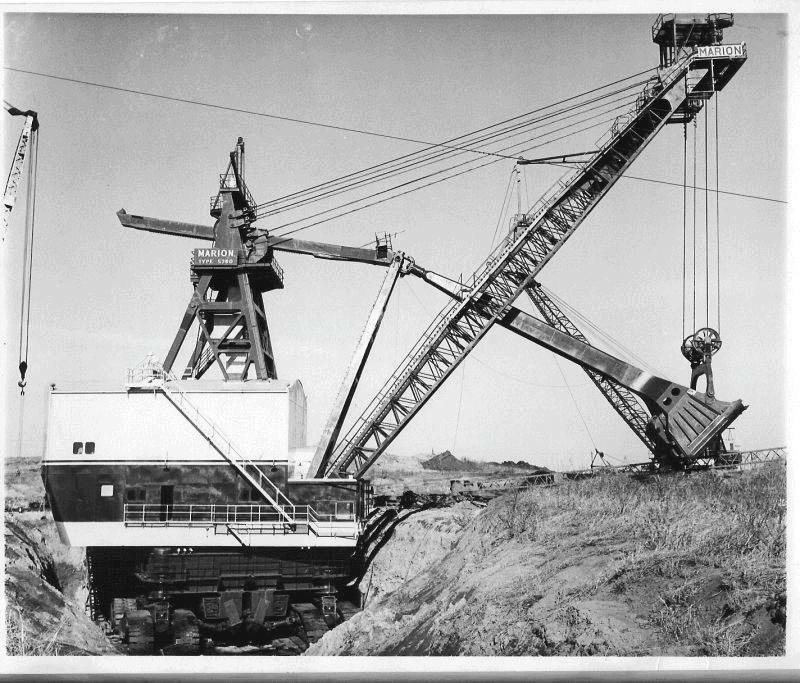 His dad, Raymond J Lang, has a very detailed photo album, of the construction of the 5760 at Victoria ILL. Jim MacAfee, Midland's pit boss at the time (1957), paid a professional photographer to document the construction. Raymond, was a welder during construction, then got hired as the ground man, then oiler, then operator. He was there during construction, and its entire operating life, and he was the one who parked it. It was scrapped in 1986. Since Ray was good friends with Mr. MacAfee, when he passed, Mrs. MacAfee gave Ray the photo album. Thanks to Joe Lang, Raymond Lang, Jim MacAfee, and His widow for these pictures, this is a valueable piece of mining history that could have been lost, but thanks to their foresight and generosity, we can all share in this historic moment. Joe sent me notes along with some of these photos, and I've attached them in quotes here..
Captions not in quotes are my own comments on the photos.